[T]he young hero and his beloved balloon are not simply involved in a relationship of admirer and admired but soon come to represent an alternative to the high-spirited street boys, who repeatedly attempt to shoot down and destroy the dancing globe on a string. Lamorisse’s red balloon is thus quickly transformed from a bouncing toy into a magical image of freedom and potentiality, and his simple tale rises to the level of fable and myth. Traveling the city with his new-found friend, the balloon’s adventures seem as limitless as the boy’s love and trust. 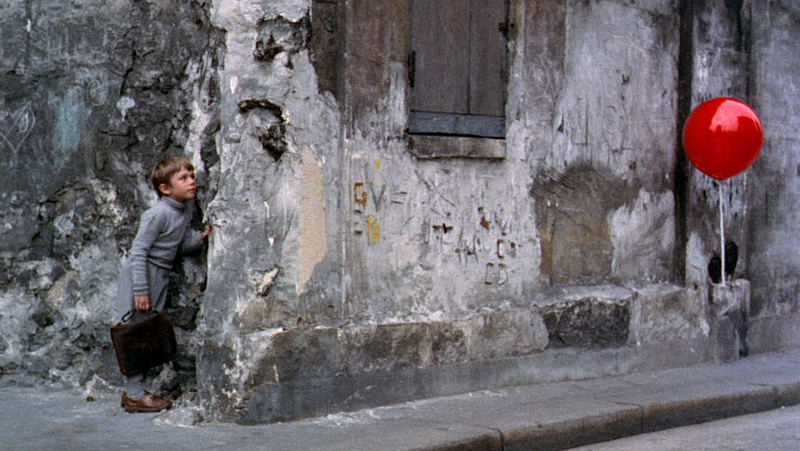 I definitely think this film evokes innocence and freedom where the post-war landscape evokes a jaded need for destruction, played out in the other children on the street. I can also see the metaphor for Christ at the end, when the red balloon dies and its “spirit” is reborn in thousands of other balloons, there to rescue the boy and preserve his innocence. Whether its message is anti-war or pro-religion, The Red Balloon features such beautiful cinematography and such a perfect example of color theory in film, that the visual effects alone could be the message. This film is one of my favorites so far this semester.